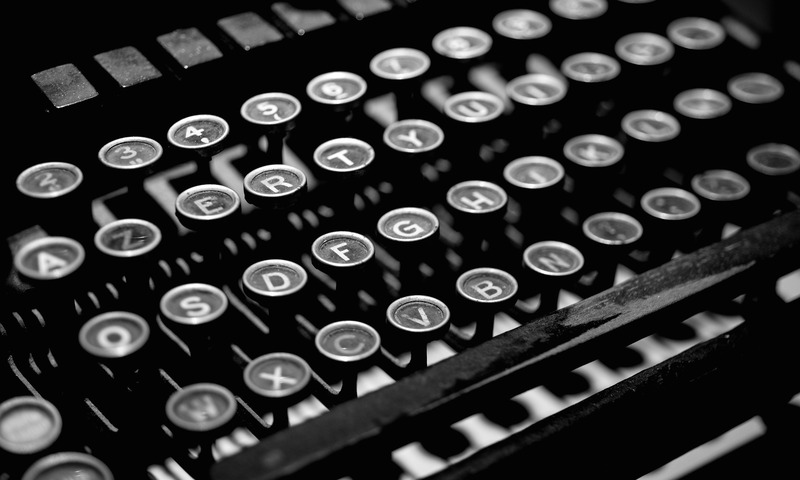 The season has begun — not the season of manic holiday shopping, although that’s alive and well, too — but the season of manic writing in the form National Novel Writing Month, the annual challenge to write 50,000 words of a novel in 30 days. To all participants, I wish you much caffeine, words, and luck. I will not be participating this year, although I have been severely tempted to throw yet one more thing on my plate. Instead I will take a more practical approach to the month of November and focus on completing my current challenge — writing and finishing every weekly story for the Brainery Science Fiction Fairy Tales workshop, which is enough work in and of itself. I AM READING Ancillary Mercy by Ann Leckie AND I’M JUST HALFWAY THROUGH AND IT IS AS AMAZING AS Ancillary Justice. Leckie is my writing idol, with how she has created unique, complex cultures combined with a large cast of interesting characters combines with thrilling storylines. See below, because only Brainery writing got done this week. All other writing was outside my ability to function last week. Finish workshop draft before class. Edit Bluebeard tale in time to submit to Uncanny. After reading a number of cryptography articles, I decided to take a chance. Instead of including some sort of science fictional cryptography in my tale, I attempted to make the tale itself a kind of cryptography in which the readers would have to determine the ultimate meaning. It was really risky and (much to my surprise) was met with positive results from my writing group to the extant that I will be attempting to finish the piece by the end of the month in order to submit it to Uncanny Magazine at the recommendation of our teacher Jilly Dreadful. This upcoming Thursday’s class will focus on The Three Little Pigs and animal testing, which may actually take me the dark and unsettling places I thought I was going last week. I have not started this yet, as I’ve been too focused on the Bluebeard tale. In You Deserve to Get Paid, But You Probably Won’t, Lise Quintana explains why Wil Wheaton wrote a blog post on how writers should be paid for their work isn’t realistic for most writers starting out. Photo by Tom Frost (Creative Commons 3.0). Saturday morning, I came to the sudden realization that I was doing Nanowrimo whether I liked it or not. After several hours of denial in which I instituted time-old delay tactics, such as twitter and tumblr, I decided on a story to work with — a novel in poems involving the interweaving and retelling of many fairy tales and myths — and began to dig in. This weekend was an excellent lesson in making time to write. On Saturday, in between switching out laundry, I wrote. After going for a 4 mile run/walk, I wrote. In the few minutes before I had to leave for the awesome Dia de los Muertos party, hosted my fantastically awesome friend Lise, I wrote. On Sunday, I woke up early and wrote, because I knew the majority of my day would be given over to helping my sister move from one apartment to another — both apartments were on the second floor. Well, one was on the second and a half floor, because there was a flight of stairs just to get to the second floor, which means my legs are all wibbly wobbly today. While my sister and mom were organizing all the moved-in things, I sat in the living room and wrote some more. The result: 3,079 words written. Already, with just that start, I feel better. The poems are more prosey than I’d like, but that’s for editing to fix. The months of feeling stuck and miserable from not writing has slid off my shoulders. This was exactly what I needed. I have a mountain of work ahead of me, but if I continue to be creative with my use of time, then I’m certain I can make it all work. 3+ — Bridal party events to attend, including the bachlorette party, the rehearsal, and actual wedding itself. 2-3 — Thanksgiving dinners. The family dynamics are shifting this year and I’m not sure how it’s all going to fall into place. 27 — Blog posts left to be written as part of NaBloPoMo. 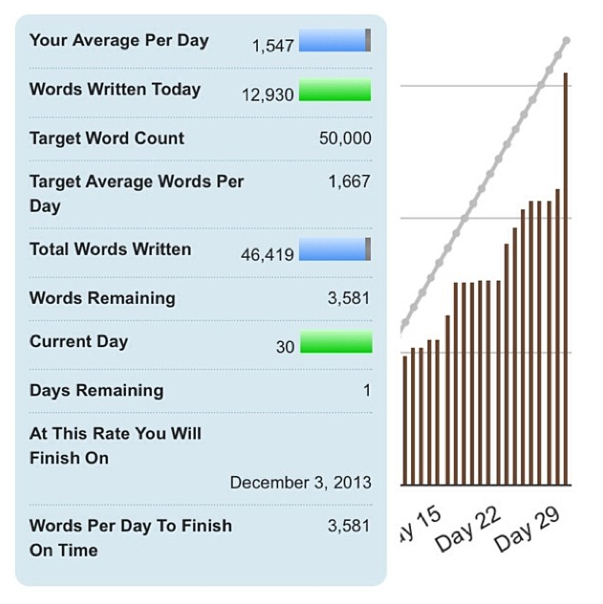 46,921 — Words left to be written for Nanowrimo. Unknown Number — Of books to be read, runs to be run, and hang out time with friends and family have to be fit in. Are you participating in any November challenges? Have you had a good kick off to the month? It’s November 1st, and here I am not participating in National Novel Writing month, not even in a modified format. I love Nano and have participated more often than not over the past eight or so years. It’s helped me write words, a lot of words. And even though much of those words were set aside or trashed, I know those words have helped me complete other projects that I’m proud of. I also wouldn’t have many of the friends I have today. So, I always feel a little sad on those rare Novembers when it participation won’t work for me, for whatever reason. This is one of those Novembers, because I will be traveling for work to the U.K. in a week and will have a slew of other events during the rest of the month. freaking, fracking dammit! I can’t do Nano. I won’t. But it’s occurring to me now — literally, right at this minute as I’m typing, seriously — that participating in Nano might be infinitely helpful to getting me back on tra— NO! I DON”T HAVE TIME FOR THIS! But I swear, I don’t have time for this. I mean, I’ll be traveling, loosing a WHOLE WEEK. But I could write on the plane. After writing 12,900 words on Saturday, November 30th in a desperate attempt to beat the midnight deadline, I found myself with no more brain cells left over. So, I stopped an hour and a half before midnight and was just 3,581 words shy of the 50,000 goal. Even though I didn’t reach the goal, I’m happy with the work I’ve done this month. I have large chunk of the novel now done and I know there ate at least a few of the scenes that I really like (hopefully they’re not the darlings I’ll have to kill later). My hope that I’ll be able to pull off the rest of the novel draft by the end of December, so I can edit in 2014. With the 13,010 words I wrote pre-NaNo, Under the Midday Moon is now at 59,429 words, which is AWESOME. I started to fall off the blog posting toward the end of the month, because all my energy was taken up with trying to finish NaNo. It was an excellent challenge though, and got me thinking about different ways to approach my blog. I’m thinking about doing the challenge again a few times through out the year (probably not when I have other intense challenges going on). I’m not entirely sure of the count, but I made sure to do a minimum of one workout a week, which is vital for my mental, as well as physical health. Reviews to be posted tomorrow are here. Day Job: We went to press on our December issue just before Thanksgiving. This involved me personally writing over 10 full pages of text, proofing every page of the 64 page issue at least three times, and working with authors and companies to get approval and photos. Lots of work. 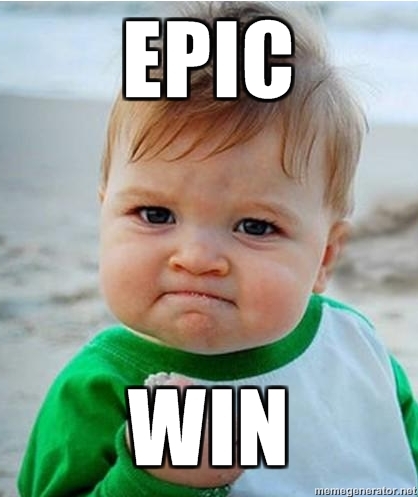 On the whole it was a very productive month and I can definitely call it an epic win for myself.